What are Croquettes? In the culinary arts, a croquette is a small patty, ball, cone or cylinder of puréed or finely ground protein; seafood and poultry are the most popular, but beef and pork can also be used. Croquettes are bound together with a starch such as potatoes, rice or bread crumbs; breaded, usually in flour, and deep-fried. Crab cakes and salmon cakes are typical examples of croquettes. Additional ingredients of minced vegetables, herbs and seasonings complete the mixture; sometimes a grated cheese may be added. They are usually served with a sauce or gravy. Croquettes are a way of using up leftovers, or stretching out a small amount of meat, poultry or seafood. The main ingredient should always be precooked before combining with additional ingredients to make the croquette. While the croquettes can be baked, they are usually fried in a deep skillet or cooked in a deep fryer. Either way, the crispy exterior of the croquette compliments the moist inside of the croquette. Traditionally, these are served with mashed potatoes. Peanut oil – fill deep skillet halfway up (about 2 inches), or fill deep fryer to fill line. In a small sauce pan, high heat, bring milk, broth, pepper and parsley to a boil; remove from heat. In a large sauce pan, medium-high heat, sauté mushrooms, onion and celery in butter till softened; about 5 minutes. 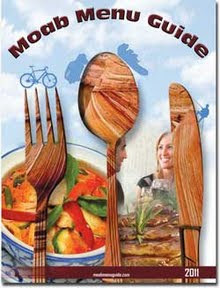 Stir in flour and coat all vegetables; slowly add milk-broth mixture and continue stirring until thickened and smooth. Remove from heat, mix in chicken and let cool in refrigerator. Makes 16 croquettes. Measure out the filling using a 1/3 cup. Shape into a cone; place standing upright on tray lined with wax paper. Set out 3 bowls for the breading process: eggs beaten with milk in 1st bowl, flour in 2nd, bread crumbs in 3rd. Dip croquette into egg mixture, coat with flour, dip into egg mixture again, then coat with bread crumbs. Return to tray and repeat till all are done. Preheat oil to 350F. Deep fry the croquettes, 4 at a time, for 3-4 minutes; coating will be golden brown and crispy. Drain on paper towels. In a large saucepan, high heat, melt butter; whisk in flour till mixture becomes smooth and begins to brown; slowly stir in broth. Bring mixture to boil, reduce heat to low and let simmer until thickened; about 10 minutes; season with pepper and paprika. 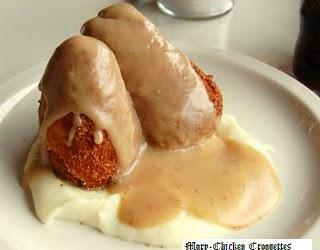 Create a 4” circle of mashed potatoes on plate; place 2 croquettes on top; ladle gravy over all.